So, first of all. Good story. I’m not a great driver. I don’t think I’m awful. I think I pay attention for the most part, follow most traffic laws, and am courteous of people around me. But, when I’m somewhere where I don’t know where I am? Watch out. I don’t adapt very well, and can cause confusion. I apologize. In this case, I was looking for Sport Burger, so my main goal was to get IN the parking lot. I didn’t realize getting in the drive through would have been a challenge beyond that. Wrong! I turned in the “exit.” In my defense, the “exit” sign only faced one direction, and I was coming the other direction. After some embarrassing backing up, and running over curbs, I looped the block and went in the entrance. For those of you who want to get in the drive through easily, you have to go in on the east-west running street (Victor Pl?). The restaurant is a yellow building on the corner of a parking lot, and the drive thru starts off of this street. From there, I ordered the Homerun Special. Which was a cheeseburger, fries and a drink. Of course I ordered cheese on my fries. How can I not? NEVER turn down cheese. Especially cheese fries. The service was really friendly. And the burgers can be made to order. They come standard with… I think fried onions, pickles, ketchup and mustard. And you can go in and watch them cook the burger, but I heard you come out smelling like grease, so I passed on that. But you can sort of see the action from the drive thru as well. And it looks like they melt the cheese on the burger (which has two patties ) while cooking. Whatever they do, it’s spot-on. The fries look like they’re just regular frozen fries, but they were fried to delicious perfection. Of course, they were topped with cheese, but those that weren’t were crisp and delicious. I think next time I might go ahead and enjoy the meal inside the Sport Burger. Partially to see the atmosphere (I regret not doing that the first time), and so I can eat my burger and fries IMMEDIATELY. All in all, this is one of the best burgers I’ve ever had. The only contender I can think of off-hand is Southeast Carryout. 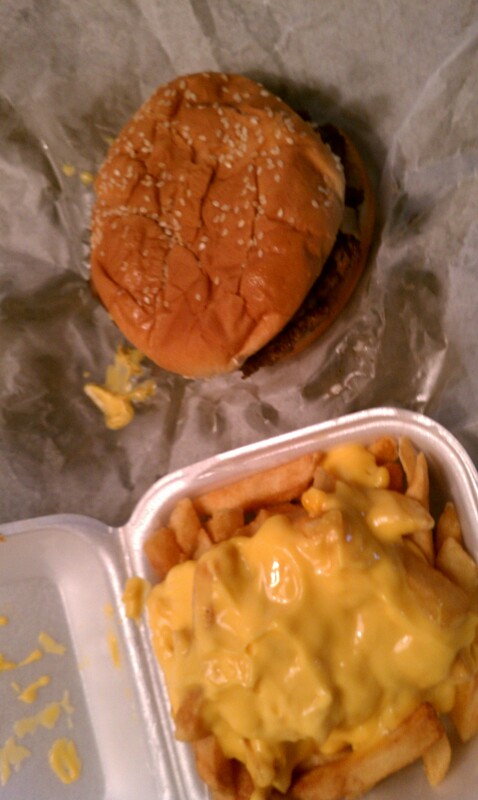 I’ve been told I need to re-try TJ’s Burger House (who might have the best cheese fries, contending with Dog N Shake). And add Walt’s to the list. So, I have some work to do before I know who has the best cheeseburger and cheese fries. But I can’t say I’m disappointed with that task. Here’s my greasy meal. And yes, it did grease through the bag. The burger. It’s from a bad angle apparently because you can’t see all the cheesy goodness. But that’s two patties. The edges of each were kind of crispy, which I liked. And the onions were either cooked ahead of time or cooked on the burger. I’m not sure, but they weren’t crispy, so they didn’t over-take the burger. I hear Hamburger Heroes in Park City is great. 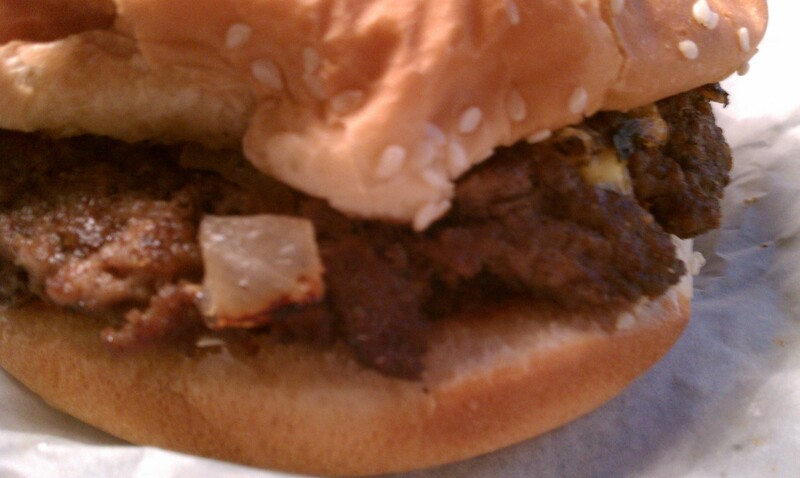 Walts at Maple and Tyler, Burger Barn at Central and Zoo and Jacks North Hi Burger are all worth a try. Oh, and Ty’s at 2nd and Seneca. I’d be happy to try any and all of the above with you….once Isa and I start walking/jogging (said with a soft ‘j’) again. I already have Walt’s and Ty’s on my list. And I’d be happy to try the others, too. See my comment to Kim about the North Hi place. It’s not that I’m unwilling to go there, but with a new owner, I wonder if the burgers are as good. Burger Barn makes me think of Burger Barn in Andale when we were in high school. I wonder if that place still exists. Probably not. That place was yummy, too. I also want to go to the Mexican place in Valley Center. And I’m currently taking reservations at one per week. I’m only booked this week and next, so pick your week now! Because they’re filling up fast. OK, not really. But seriously on the only eating out once a week thing. It has to happen. I can’t believe you’ve never tried Sport Burger! This is Preston’s favorite place to eat! I tried it a long time ago when Preston still worked at the Stables and I went there with Kendra. Oh, and if you go to Walts, they are not all the same (some are definitely better than others). I’ve also heard that North Hi Burgers is awesome and I always wanted to go to TJ (people at work (when I worked) went there and loved it)! 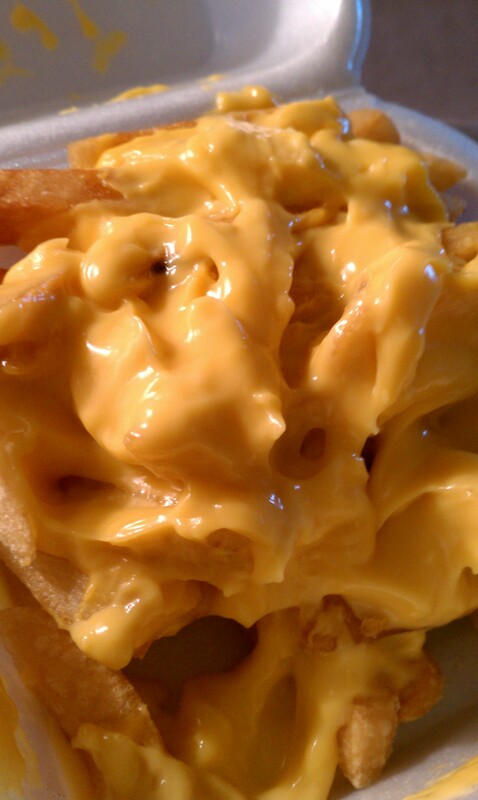 I had no idea they had cheese fries at this place. Oh, and Rocky and I REALLY wanted Sport Burger one time when we were over in that area, but no one was there so we assumed they were closed. DARN! I wish we would have just pulled up. I wasn’t that impressed with TJ’s. I should probably go back, but am not in a huge hurry. Walt’s is on my list. But that North Hi place was bought by someone else this year, so I’m not in a huge hurry to go there (although I will). I also wasn’t impressed with Osasis’ burger when I tried it several years ago and then again this pas year. And now that you say that, Kim, I DO remember Preston touting this place. I KNEW I’d heard of it, and thought I’d been there b/c of that. So now I know that it was because of HIM. Mystery solved! Man I love me some Sport Burger, particularly the 99cent burgers, perfectttt meat, toppings, bread ratio. I just recently discovered Yelp! It’s awesome!